We have been very busy working out double numbers using our fingers and other apparatus too. We worked out that all double numbers are even and are in the two times table! Some of us were able to work out answers using doubles to find out near double problems – our brains have been working overtime!! For ICT this week we had great fun using special software to compose our own music sequences: the resulting masterpieces were very exciting to listen to! As a special treat, Jo from the ‘David Shepherd Wildlife Foundation’ came to see us. She explained how the foundation helps to prevent 6 species of animals from being extinct and we also enjoyed learning some new facts about tigers. 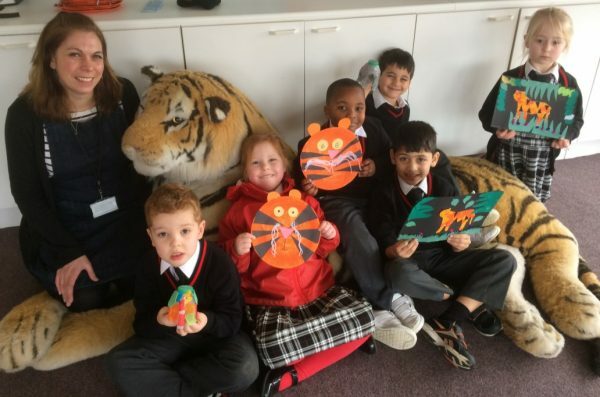 Then we made wonderful tiger faces. Our busy week continued as we dressed up as characters from Janet and Allan Ahlberg’s books for World Book Day. So many different books and so many characters, we looked fabulous in the school parade. Then we had a lovely afternoon listening to Kevin Price, our guest author, read a couple of his books to us.